Police called to the scene after explosive-laden balloons land in southern Israel. 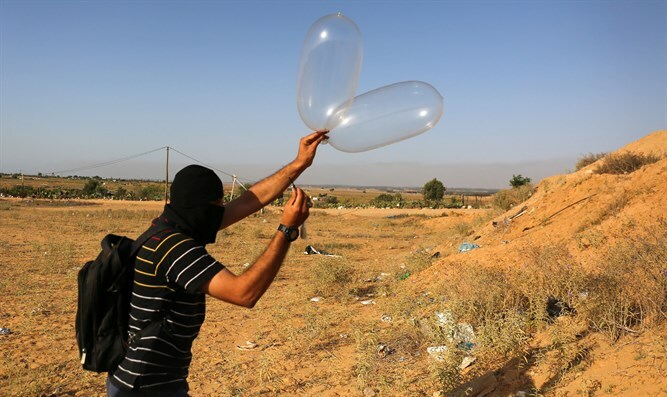 Israel Police units in southern Israel responded when 2 suspicious balloons were found and reported, a spokesman said. Police bomb disposal experts arriving at the scene prevented further danger. Police also reminded the public not to approach suspicious objects, and to notify police when any are spotted. Separately, incendiary kites and balloons launched into Israel by Gaza terrorists on Saturday sparked six fires in Israel. Firefighters, Nature and Parks Authority staff, and JNF volunteers worked to gain control of the fires, which they eventually succeeded in extinguishing.